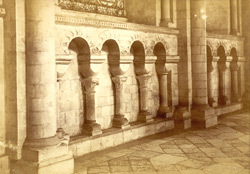 Arches in the north aisle of the choir, Canterbury Cathedral. Founded in 597 by Saint Augustine, the cathedral was rebuilt in the Romanesque style by its Norman Archbishop Lanfranc. In 1174 a fire destroyed much of choir, but during its subsequent reconstruction the outer walls of the choir aisles retained much that is early 12th century undamaged. Several shafts and capitals were replaced in the 1170s, so that a comparison can be made between between the axe-cut mouldings of c. 1100 and the chisel-carved ones of 1170s.